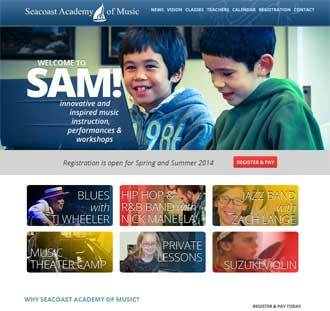 A business website for a music academy in North Hampton, NH. A music school had outgrown their existing HTML website. A new dynamic website was required profiling teachers, classes, and music events. The would also use forms and PayPal to allow visitors to sign up for classes. The also need to be mobile responsive. An extensive graphic design was created by Graphic Details. WordPress was chosen as a content management system. Custom post types were created for teachers. Classes were managed with complex forms.